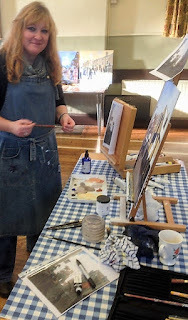 Ruth Gray Images: Guest Blog by David Walker of Yoxall Art Group. 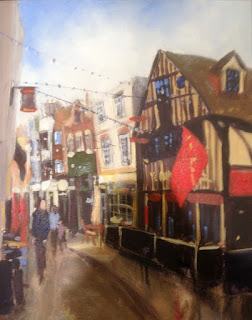 Guest Blog by David Walker of Yoxall Art Group. The Art of Stylisation by David Walker, Yoxall Art Group. 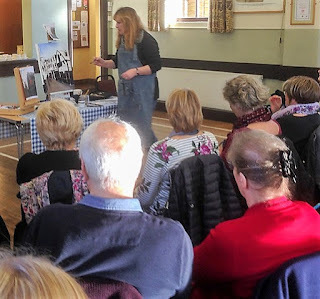 Fresh from the detailed article on her painting “Christmas Eve at Castleton” in the journal “Paint” (The Magazine of the Society for All Artists) Ruth Gray entertained the members and guests of the Yoxall Art group on 8th November with an excellent demonstration of her stylish, abstracted painting techniques. The audience was immediately involved in the chosen image of the day, a view of George Street in Hastings, East Sussex. Ruth had pre-prepared the canvass by sketching the outline in watercolour marker pen. That immediately drew gasps of disbelief from the audience, but Ruth did assure them that the water based marker would be washed away as she continued the work. The original sketch was certainly robust, but as soon as the work began you could see how the method worked to achieve the expected result. A key advantage of using the watercolour pen was, unlike charcoal or pencil, there was no shiny residue to contend with. Ruth then discussed her choice of acrylic paints and her colour palette. Having lived in Australia for a time she much preferred the Atelier brand which was developed, and is manufactured in that country. Atelier is much more forgiving in the drying problem which can make using acrylic paint difficult. This development was probably because of higher temperatures in Australia meaning an even bigger problem of paint drying on the palette, especially when working “en plein air”. In the more moderate UK the paint, when protected by a plastic bag, was still usable the next day. She then started in earnest on the work, starting by brushing in the sky and foreground, with large, bold strokes. This initial work was revisited later to add some of detail. Then the emphasis immediately changed to the dark tones and immediately you could see the wisdom of her choice of the watercolour pen. The outline of the people was also undertaken in the dark tones. She then progressed through the mid tone colours and eventually on to the general highlight colours. The spot and highlight colours were then added as part of the finishing process adding details to people, buildings, signs and flags to arrive at the final painting. Within a couple of hours Ruth had produced a wonderful representation of George Street, that would not be out of place in any living room! Of course, there was some finishing of detail still required, this would be added later after a period of drying. All told an exciting and instructive demonstration by a very competent and respected artist. Everyone took in new ideas and thoroughly enjoyed the day. 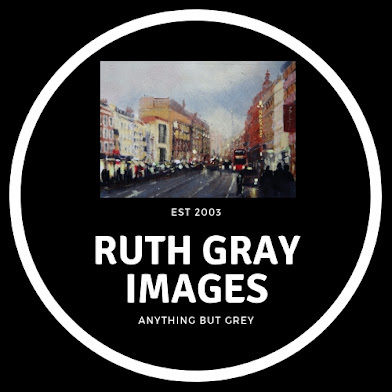 Ruth’s website http://ruthgrayimages.net is well worth a visit!